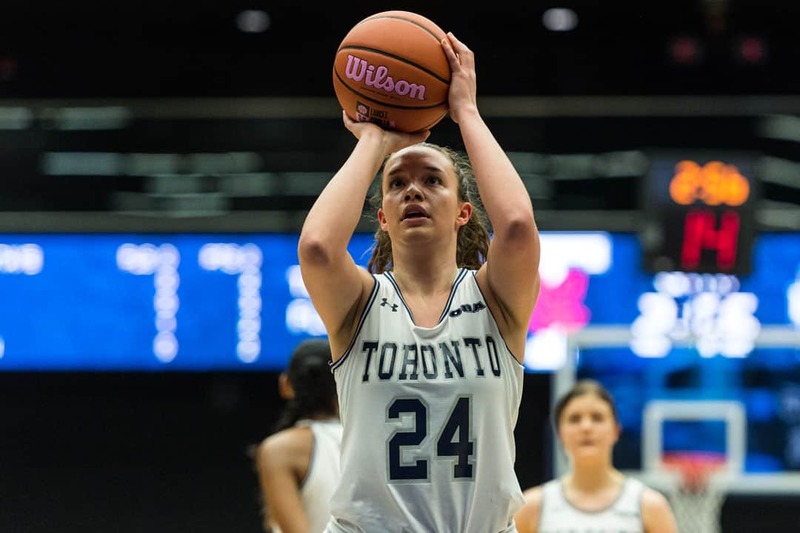 The Varsity Blues women’s basketball team came up big on Friday night, securing their fourth win at home in a 70–48 victory over the Nipissing Lakers. As a team who have had more than their fair share of injuries, the Blues squad was on full display as they ended their four-game losing streak with a well-earned victory. The Blues started the game on the right foot, going up 7–0 and setting the tempo for the rest of the game. A key factor was Mahal De La Durantaye, who fearlessly hustled for rebounds on both ends of the court. She grabbed three steals in the first quarter alone, most of them translating to points on the offensive end. Ariana Sider opened up the second quarter with a beautiful spin-move, pulling up on a lost defender and beating the shot clock. Later on, Sider stole the ball and fed it to teammate Nada Radonjic for the layup. Radonjic responded by stealing the ball on the following possession and giving it back to Sider for a three-pointer. Toronto’s defense gave up just two points in the first six minutes of the quarter and by halftime they were up 11. In the third quarter, the Blues’ seamless ball movement resulted in lots of open looks as the whole team got involved. Radonjic caught fire as she proved she could do everything from low post moves to threes. Her many heavily contested jumpers would help make up her 25 points on the night. Radonjic finished with a double-double and shot 11 of 22 from the field. The Blues only added to their lead in the fourth and won by a comfortable 22 points. Jessica Muha, who came off the bench in her first game back from injury, dropped 15 points in 15 minutes. De La Durantaye led the team in rebounds with 12 and finished with four steals. Sider also picked up four steals, and despite running most of the plays, she finished with zero turnovers. From how they looked on Friday, the whole team has done an excellent job at that in the absence of their three fourth-year veterans Keyira Parkes, Sarah Bennett, and Charlotte Collyer. The Varsity Blues men’s basketball team fought throughout all four quarters to pull off U of T’s second win of the night in Friday’s double header. Nipissing showed little sign of giving up however, as they kept the game within one point until the final minutes of the game. It was Toronto’s ability to stay composed under pressure that made the difference, as they knocked down multiple big shots to defeat the Lakers 81–75. Nipissing began the first quarter by hitting a three, to which the Blues responded with one of their own. In the first two minutes, Toronto lost veteran Nicholas Morris, who picked up two early fouls and had to be subbed out. However, first-year guard Iñaki Alvarez sliced through to the basket in addition to knocking down a couple three’s off well-placed screens to put the Blues up two into the second quarter. Daniel Johansson got hot in the middle of the second quarter after the Blues’ motion offense gave him an open three, which he knocked down. He followed with a layup on the next play and then a heavily contested jump shot, giving Johansson seven points in three possessions. “We like to play off the hot guy,” Blues guard Chris Barrett later explained. Toronto would extend their lead to nine and force Nipissing to call a timeout as a result of Arash Dusek’s driving layup. The Blues’ lead peaked at 11 points in the third quarter, with offense led by Alvarez and Johansson. The persistent Lakers still brought the game within one before Nikola Paradina drained one from beyond the arc for 3 of his 16 points on the night. In the fourth quarter, Alvarez continued to make several difficult layups before suffering an injury to his abdomen. He was forced to sub out and did not return. With just under five minutes left in a one-point game, Barrett stepped up and put the Blues up by three with a spin-move layup. He later hit a ridiculous fading turnaround jumper to increase Toronto’s lead to five. He proceeded to make four out of four free throws in the clutch, as the Blues held the Lakers off by a margin of six. Despite having to leave the game early, Alvarez led the team in points with 19. Four out of the five starters finished with 15 points or more, and Barrett had a game-high seven assists to complement his 17 points. When asked whether or not he felt pressure toward the end of the game, Barrett responded, “When I’m shooting free throws, I’m never stressed.” It certainly showed in his eight for eight shooting from the line.